Feel like at home! 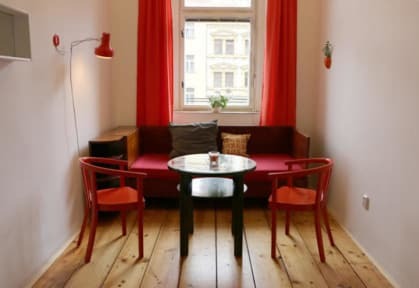 We’ve designed our hostel with original vintage furniture. It is close to the centre, main bus and train st. Many pubs and genuine bars are nearby. Zizkov quarter is real Prague and it's much cheaper than the centre. We are located in prague's typical rental house. Free wifi in all rooms. Hostel Lipa is a small family hostel. We’ve designed the rooms in a way that we would like to find on our travels ourselves. Our hostel is good base camp to get to know all parts of Prague. There is a shared kitchen with dishwasher, microwave and other equipment. There is a parking spot near the hostel (about 200m away) in the yard of Bowling bar, the fee is 250 CZK (10 Euros) / 24 hours. We don't have a permanent reception so please send us your arrival time in advance by email, or call us. 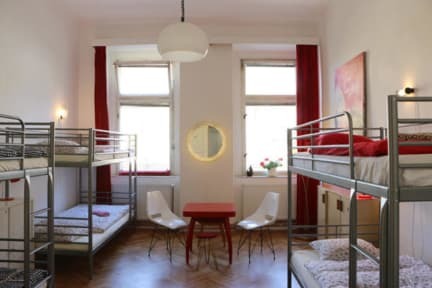 We are here daily 9 - 16 and outside these hours we are operating via our 2nd hostel's reception - Hostel Boudnik, Dalimilova 4, Prague 3 - which is 5min away by foot and has non-stop reception. We need to discuss where you will pick up the key to get in, if directly in Lipa (9-16) or Boudnik (16-9). Hostel Lipa has 6 rooms - three dorms and three private rooms. Blue room (6 beds) and Green room (6 beds) are mixed dorms and red room (6 beds) is a female dorm. Yellow and Vermillion are private rooms with double bed and White room is private double room too, but is very small (5 sqm). This is cheap private double room for low budget travellers. - Red room is 6-bed female dormitory with 3 bunk beds. - Blue room is 5-bed mixed dormitory with 1 bunk beds and 3 single beds. - Green room is 6-bed mixed dormitory with 2 single beds and 2 bunk beds. - White room is the smallest room with one king-size loft bed. - Yellow room has one king-size loft bed and it's possible to add 1 truckle bed. - Vermillion room has one king-size loft bed and 1 extra bed (couch). Atendimento e pessoal muito bom! A oferta até do cartão do transporte facilitou muito a estadia. Infelizmente a cozinha ficava um pouco suja e bagunçada e a cortina do quarto nao permitia dormir depois do nascer do sol e isso se dava as 6h. O resto estava muito bom!